One of the weirder “based on a true story” movies that you are going to see. Every May, the group of five friends come back together (wherever they may be) and resume the same game of tag that they have been playing for 30 years. However, this year is different. Jerry (Jeremy Renner), who is getting married, is supposedly retiring from the game after never having been tagged. 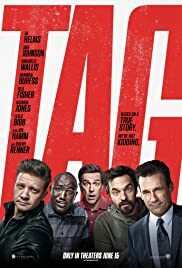 So Hogan (Ed Helms) pulls together Bob Callahan (Jon Hamm), Kevin Sable (Hannibal Buress), and Chili Cilliano (Jake Johnson) in a determined effort to finally tag their friend. I really enjoyed this movie. The chemistry of the five characters, as well as Isla Fisher who played Hogan’s wife, Annabelle Wallis who played a reporter from the Wall Street Journal, and Leslie Bibb who played Jerry’s fiance, were off the charts strong. The interactions between characters is what kept the movie from losing itself in some of the more over-the-top situations that it found itself in. There are some really funny moments. Many of them came about when the group has come up with a convoluted plan to trap Jerry but Jerry finds an even more convoluted way to escape it. Jeremy Renner is fantastic in this movie, really showing the arrogance of Jerry. The film would stop and give us an inside the mind play by play of what Jerry is thinking as he avoids the tag. This is very similar to the way Robert Downey Jr’s Sherlock Holmes breaks down a scene where he needs to act. Renner was excellent, especially since he had both arms broken in the filming of this movie and much of what we saw on screen was CGI renditions of Renner’s arms. The tone of the film changed as it progressed, turning nastier as the group continued to push the envelope further with each attempted tag. There may be some times that people think it steps over the line of good taste, but I did not find myself feeling that way. The third act did seem to become darker than expected, but that was explained near the end of the film. Tag may feel lightweight, but it really does have a lot to say about friendship and how friends can grow apart over time. There is a good amount of exploration of friends and the lengths that they have to go to remain in each others lives. And even though you may consider yourself a friend, there may be parts of your friends’ lives that you are not aware of and that truly affect them. Tag ends with some real life footage of the real life group playing their game of tag, if you doubted that this was based on a true story. I had a good time with Tag despite the story getting a little too dark in the third act. A great cast and some good laughs carried the film to a successful end.